The Village of Butler truly owes its very existence to the railroad. It all began in the Fall of 1909 when representatives from the Milwaukee, Sparta and North Western Railway, a division of the Chicago & North Western Railway (now owned by Union Pacific), visited farmers on the east side of 124th Street and offered to buy their farmland to establish railroad yards as an adjunct to an outer belt line around the City of Milwaukee to relieve freight congestion in the downtown railroad yards. One of the more significant property acquisitions for the construction of the “New Butler” railroad yards was the $18,000.00 purchase of the George and Jennie Clarke farm. The Clarke’s reserved the right to move their house off the land prior to the start of construction in the spring of 1910. The house was moved across the fields on rollers to its present site on the family’s ancestral farm at what is now 128th Street and Hampton Avenue in the center of Butler. Today the Clarke house is a public museum dedicated to the settlement of the Village and its connection to the Chicago & North Western Railroad. At that time the construction of the “New Butler” railroad yards represented one of the most extensive and costly railway projects in the Midwest. The railroad yards contained twenty-one tracks and accommodated 1,525 cars at one time. North of the yards was one of the largest railway roundhouses in the west. It contained fifty-eight stalls, an oil warehouse, machine shop, powerhouse, general storehouse and coal chute. The coal chute held 600 tons of coal and was capable of supplying four engines at one time. A dormitory and clubhouse, locally known as “The Beanery”, was located just west of the yards. In 1911 the settlement of “New Butler” was established in Waukesha County, Wisconsin. The small community was settled mostly by railroad workers and their families and was incorporated as a village on May 5, 1913 with a population of 200. The small village grew steadily as the original developers and real estate speculators bought acres of additional land for future development based on the activity generated by the nearby railroad yards. In the summer of 1913, Railroad passenger service was introduced creating a new mode of transportation for village residents. The “Shop Train”, as it was nicknamed, served as the main connection to the retail shopping district in downtown Milwaukee. 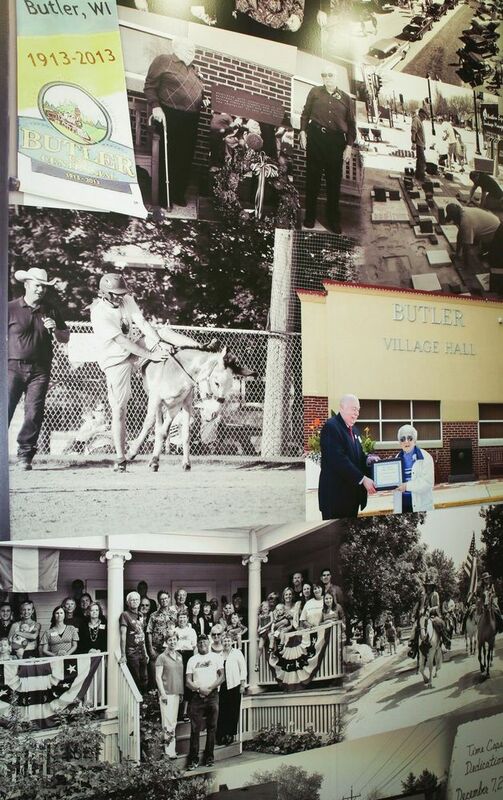 The “New” was dropped from the village’s name in 1926, and the Village of Butler continued to thrive as an incubator for business and industry due to its proximity to the railroad yards. To this day we continue to celebrate and promote our village’s history as a “railroad town” in many ways such as our official municipal logo and the operation of the Clarke House Historical Museum. Moreover, in 2013, the fully restored Chicago and Northwestern caboose #11207 opened to the public as an interactive historical display of the Village’s “railroad town” roots. Today, residents of Butler enjoy a small town feel while maintaining close proximity to major interstates and downtown Milwaukee. Numerous community events such as, the Christmas Parade, Independence Day Parade, softball leagues, and National Night Out are held annually. Home to both significant industrial and retail businesses such as Cargill, Western States Envelope, and Molded Rubber and Plastic, Butler balances commercial and residential interests. Butler’s mix of residential and commercial properties offers residents old and new, and a good place to start and a great place to stay.